Up, down, up, down. Oh, what a ride! I always wanted to go again. You know, it was just so interesting to me that a ride could make me so frightened, so scared, so sick, so excited, and so thrilled all together! Some didn't like it. They went on the merry-go-round. That just goes around. Nothing. I like the roller coaster. You get more out of it. Just yesterday, I wished Life was like a TV show. Remember? Van Morrison playing in the background while a montage of the day flashes before our eyes. The good, the hard, the tears, the laughs. The real moments in Life. The stuff it's actually all about. And at the end, this sense of perspective washes over you. Everything makes sense. Just yesterday, that's what I wished. And now, as I chat here with you, I realize that at least for today, my wish came true. I want to remind you, sometimes wishes really do come true. For me- and for you. That's why I hate the phrase, Be careful what you wish for. I say, Wish away. Right now. Big ones, little ones. Ones that people tell you are out of your reach. Wishes that people tell you not to wish. Yes, those. Wish those. Never give up. Tonight was perfect. In an amazingly imperfect real human wonderful way. There were screams and meltdowns, yes. But there were Friends and fun and candy and costumes and Trick or Treating. Click, click, click, click, click...we headed to the top of the coaster, a little afraid. And so many thoughts swirl in my head and I just know I can't do justice to these thoughts. However, I must try. I need my words to match up with this feeling. Oh my goodness, this feeling of calm and perspective and hope and Unicorns and glitter and chocolate and just everything good. Sometimes layers of disappointment build onto themselves. They pile up on top of each other, and although they are heavy, you get used to it. You try to ignore them. And you talk to yourself--Don't get your hopes up. Don't want this so bad. You try to push down the hurt that bubbles up. And so often, you feel disappointment. Then you try not to feel guilt for the disappointment in the first place. You want it so very bad, but it's just not yours to have, at least not at this time. And you try not to hope too much, because although you think you are growing numb, you realize with each inhale, you aren't. It still hurts. But sometimes, like tonight- your simple everyday wishes do come true. And it's coated in sugar, because you thought it wasn't your wish to wish. And you are strangely grateful for the imperfect circumstances in your life that have taught you to appreciate things so completely and whole-heartedly. Click click click click click to the top....Weeeee!!!!! And we lifted our arms up high into the air and with eyes closed, felt the breeze whip at our face. Exhilarating. The fear of the climb was gone. There was only the thrill of the ride. 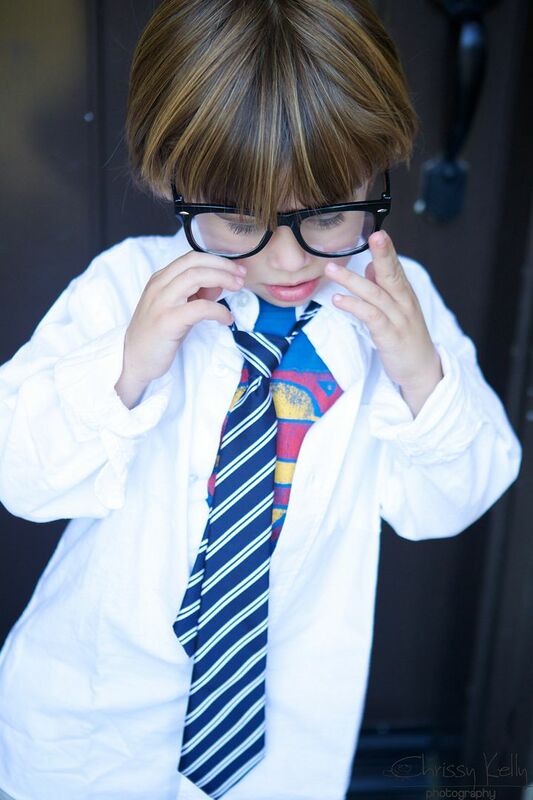 My Clark Kent. 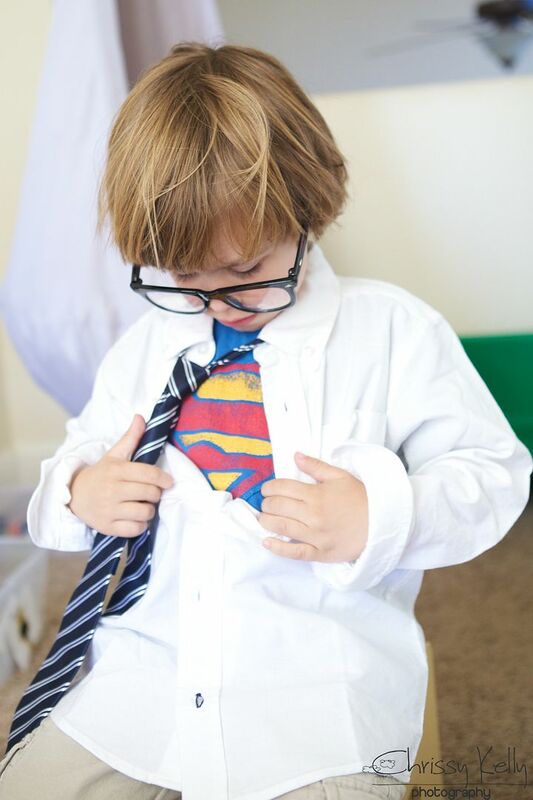 Just like Greyson- a regular boy with Super Powers. A boy changing the world. It was hard for him to keep the ginormous glasses on. For the first 5 minutes he HATED the tie. OFF! OFF! OFF!!! And then we were honey dripping golden magic. And as soon as Doodle woke up from a late nap, we went to a Friends. I have to take more pictures of Parker tomorrow when the lighting is better. 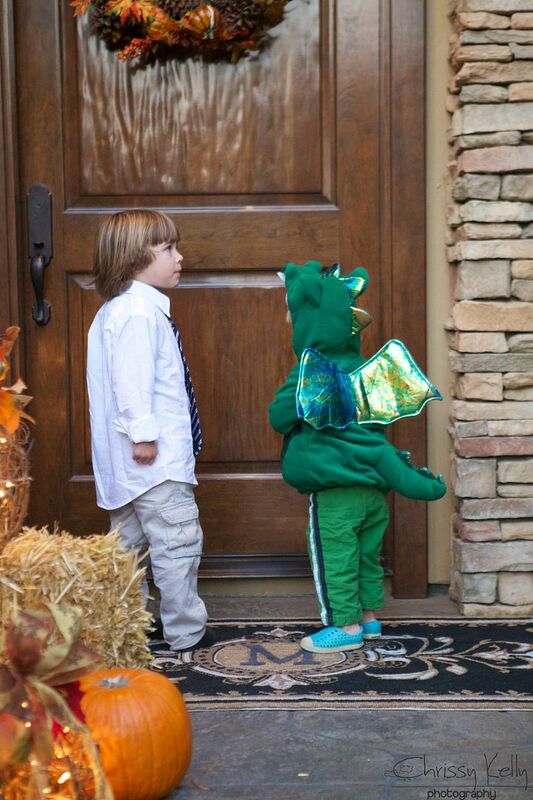 If you didn't get the shots you want of your kids- just have a costume redo when it's not so hectic. Here's my costume. I was going for a Heidi Klum vibe. And we actually trick or treated. There was even some jumping. Dragon Doodle was a pro. Okay, fine. Here's my actual costume. Game time decision. 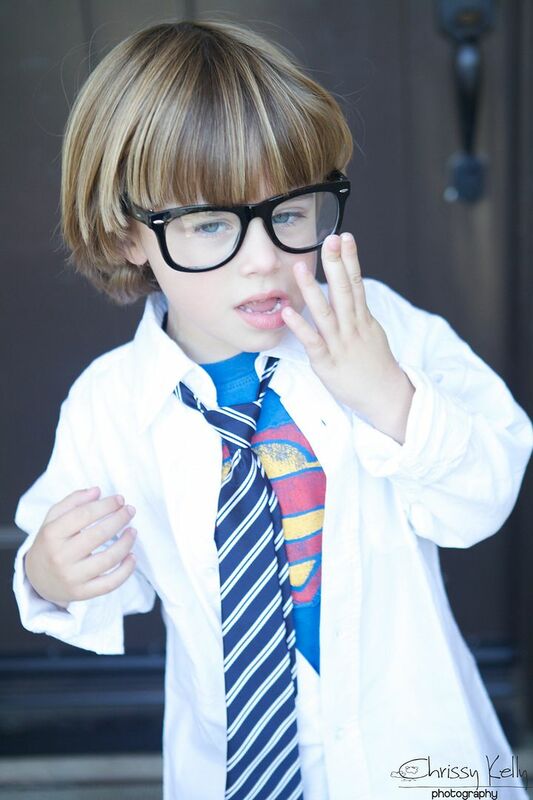 I was a spider, wearing Clark Kent glasses because Grey was just over them. 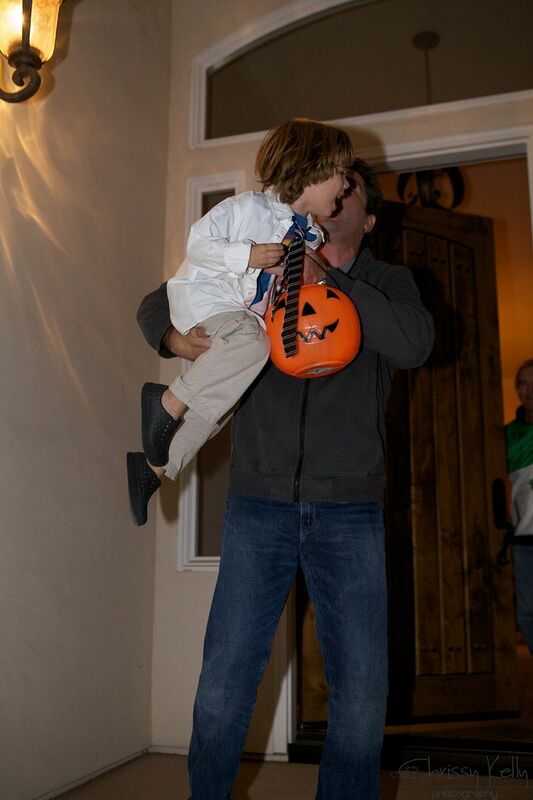 We had to hold Greyson- otherwise he would go into the house where we were Trick or Treating. Not politely stand in their entryway- No- he wanted to go completely in. Check out the joint- stay awhile. 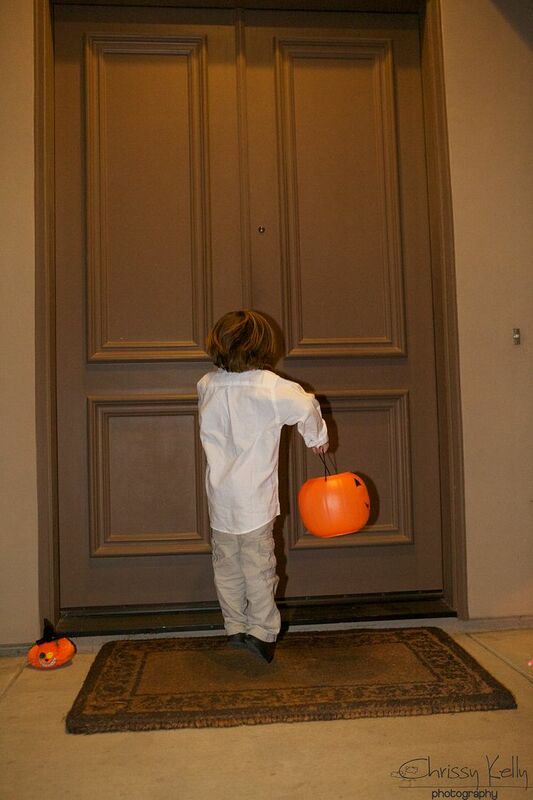 He didn't want candy- he wanted to hang out. When he realized he couldn't go in- he would start to scream- LOUD. And then desperately try to get down so he could run in. Yes, thank you! We would say as we politely smiled over the screams. It was so funny- and I can totally see why this whole process was so confusing for Grey. We made it to about 8 houses- and the boys were done and so were we. We did it. The ride was over. We did it. I still can't believe it. And although I am glowing with excitement- my heart and my focus is with you- my Super Power parent Friends whose evenings didn't go as hoped or expected. I've been there. I could be there next Halloween too because you know how it goes. It's not an easy gig- but you tried. I am so proud of you. Don't you dare stop wishing- your wish too will come true. You are not on the Merry go round, but that's a good thing. I promise you'll get more from the Roller Coaster. Please know I'm here on the coaster with you. I wish I was just as brave. 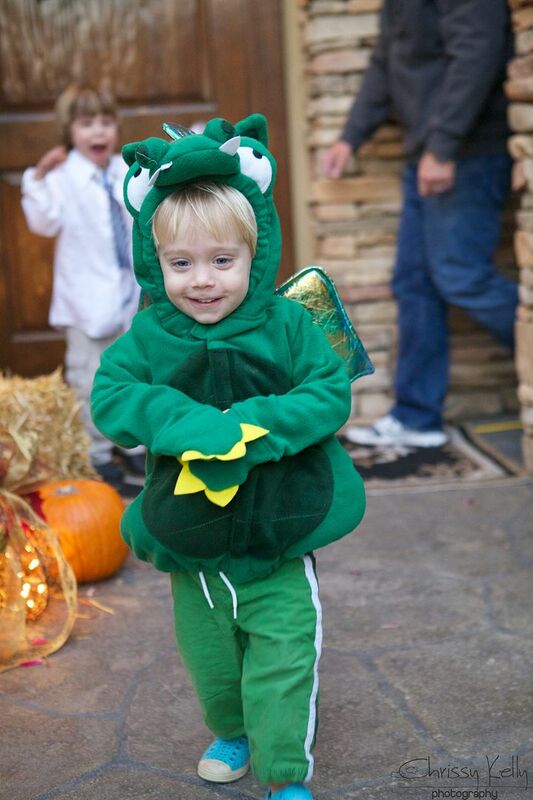 My twins did their first trick o' treating at their ABA program. I just didnt have quite enough in me for tonight. I blame their bedtime being early...baths...no one to go with us...etc. Next year...there is always next year. What a Handsome Superman and an Adorable Dragon....I hope I got that one right...but what ever that costume is HE makes it so flipping cute. Good job mom and dad. Chrissy Kelly......you are a beautiful person, writer and mom. I love to read everything you write and after I always wish i could run down the street and hug you. You are inspiring. Thanks for sharing. We have our struggles and it helps to watch you be so brave and hang in there. Your pictures are amazing. What kind of camera are you using? Canon Mark D 2. Thank you! I am so glad you all got to do a little trick or treating. I know that feeling in the pit of your stomach when you don't think things are going to go well. We had an issue with my son last night as well. He hated his mickey hat and cried all the way walking down the street. 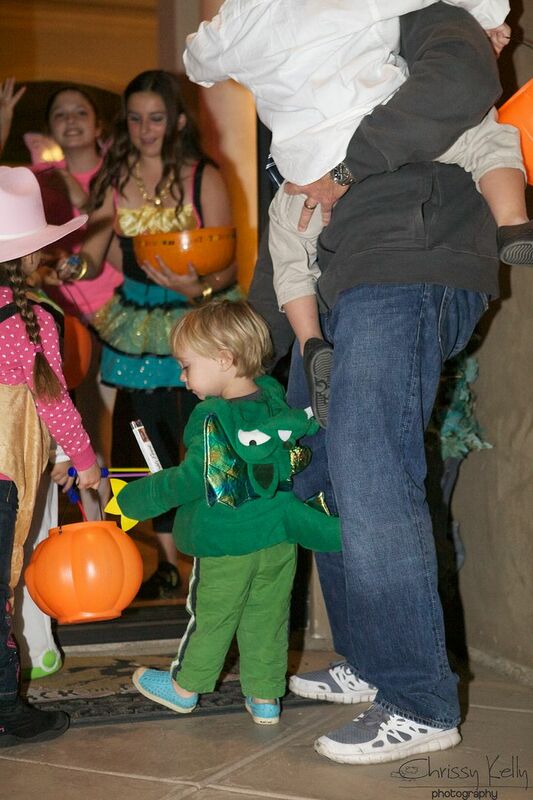 Thankfully once he started getting candy he sort of figured out what it was all about and had a great time. Really does make your whole day when you children are happy. That is great advice. I almost didn't go because I knew it would be a total disaster, but I made myself put in their costumes and go to a few houses. They loved it! My son didn't understand the knocking part and instead wanted to open the door, but he even said thank you all by himself. It was incredible and while not perfect it was a dream come true for me too. I don't have kids with superpowers, but I know the feeling of wanting everything to be just so, just the way you imagined things before you had kids, etc. And then reality sets in - superpowers, personalities, anything. Usually those feelings have prevented me from really enjoying the moment - but like you, I was able to appreciate it yesterday - my kids' first trick or treating - and I'm so glad I did. Keep on writing, you are terrific. I'm so happy you had a good night. YAY! I agree with Jennifer Miracle. The Heidi Klum costume was nice but the spider was AWESOME. Yay! So proud of you and them!! I love this post. I'm so glad you went and had the experience of 8 houses. Just think of it! Eight houses! Maybe next year it'll be ten. I think we did 12 this year. Lots of extra door bell ringing and trying to get past the door to explore the inside of the houses, lots of jumping, but also a few "bye's" (his one clear word) and some nice hand holding. I used to focus on the negative, but now I grab at anything positive and hold that dear as my memory! Sharing your stories with us is such a gift. I wish you would write a book, so I can pick it up and read it and flip through it and keep on getting encouragement. You are an awesome mommy Chrissy Kelly and your boys are so blessed to have you has their mommy! Chrissy! 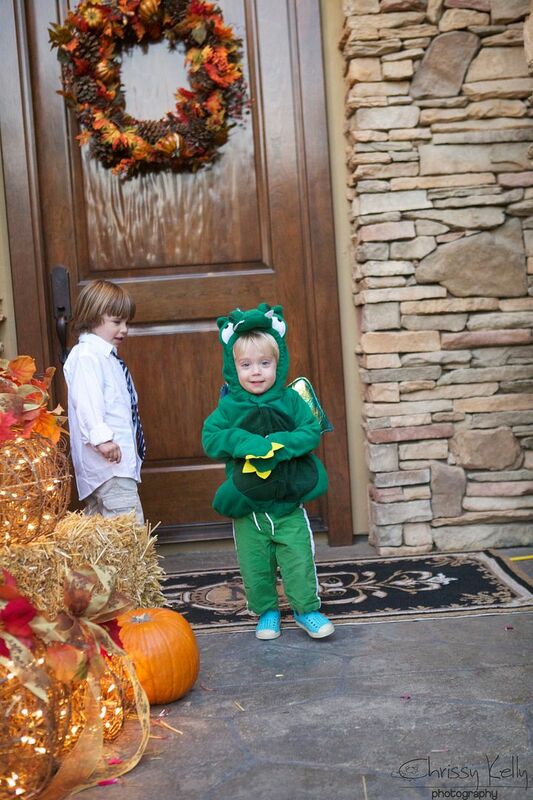 Davis went Trick or Treating too!! He wouldn't put on his firefighter costume for WEEKS at home and I was starting to let go of my desire to take them- decided to just go with Davis's flow. BUT. Then I thought I'd take his costume to ABA and see what they could do. When I went to pick him up on Thursday, he was walking down the hall, happy as a clam in his firefighter jacket and hat. Not only that, but they told me HE ASKED TO PUT IT ON. What the HECK!? ABA Therapists Are Miracle Workers. MIRACLES. They practiced trick or treating with the other kids in the clinic and he was thrilled with the whole experience. 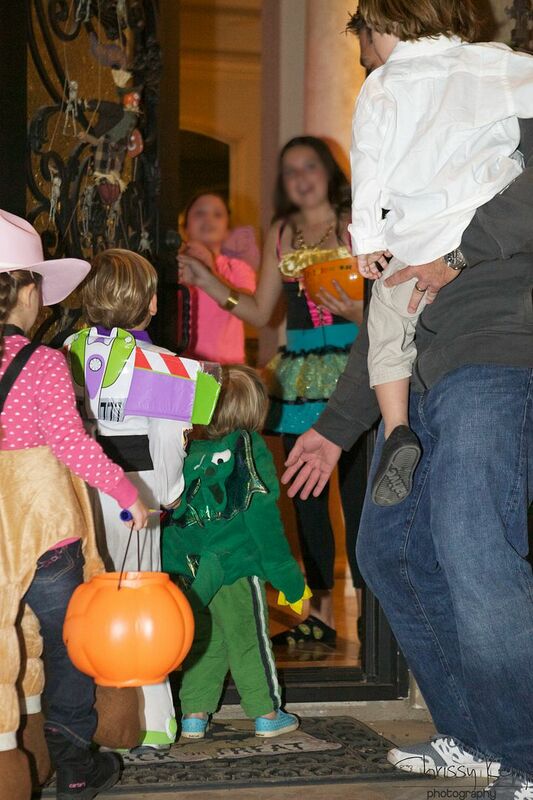 That night when we suggested trick or treating, he told us it was time to put on his firefighter jacket. Wouldn't do the hat but who cares. Put on his jacket and boots and said trick or treat and hi to the neighbors and please and thank you and took good care of his baby sister. ADORABLE. What a wonderful night! I say wish away, too. ESPECIALLY if you have an ABA Therapist in your corner!! :-) Sending you love. and also, you'd be just as gorgeous bald so don't you worry about this hair thing. It's going to be fine and you are beautiful.